Trend Alert: Double the Fun with Combo Trends! Why wear just one trend when you can double the fun not to mention the added challenge of sporting two together? 2013 saw the trial and error of countless independent textured styles. Taking this a step further we forecast a grouping together of these same elements in the coming year. The process has already begun to a large extent. Another way to look at it is fabric blocking with contrasting materials aesthetically infused together in harmony. Here are some of the ways you can try it! Leather and lace: Hyper feminine meets biker chic with this double edged sword combination that speaks to the woman who has multiple facets to her persona. It is the perfect example of opposites attracting, bringing together delicate luxe with urban sporty glamour. Pair a lace summer dress with a rugged motorcycle jacket, leather tights with a lace top, or leather separates with lace insert panels for a peek-a-boo effect. Print and Sequins: Sequins, shimmer, and metallic accents all had a major moment last year. Most often encrusted on to solids, we hope to see a lot more of print in the mix especially for Spring 2014. Ahead of the game are Zara Shahjahan and Zari Faisal who displayed sparkling freshness with their vintage floral printed lehngas and cholis coupled with high shine factor embellishments. 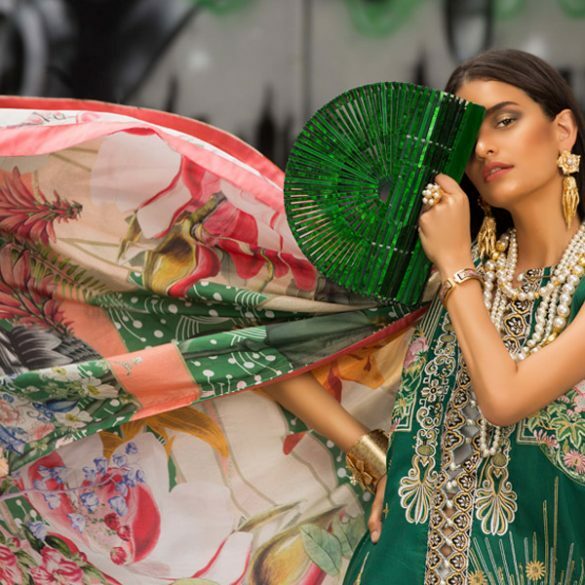 Nida Azwer and Shehla Chatoor have also played with this style that is perfect for trying out at the upcoming round of spring time Mehndis where the triple threat combination of color, print, and shine is more than welcome. Velvet and Sheer: If you’ve been paying attention to the international runways along with Hollywood and Bollywood red carpets over the last two years, you’ll agree that the sheer trend went a tad overboard bordering on tacky. The concept is still very versatile and is being adapted as a supplemental fabric to highlight curves and cuts on opaque mediums such as velvet. Again a form of pairing opposites to attain a beautiful balance, the velvet and sheer trend is great for layering as well as creating insert cut work shapes. For a more eastern look you can also pair velvet with organza and French net to assemble a richer luxury ensemble such as a formal sari. Denim and Crochet: An old school, light hearted, flirty summer trend underlined with bohemian flair; it can be adopted in its simplest form with a favorite pair of distressed jeans coupled with a pretty open weave off shoulder top. The vintage weave made its way onto Resort 2014 runways of McQueen and Burberry among others as did luxe denim at Balmain and Chanel to name a few. We’d love to see both essential elements explored simultaneously. Crochet doilies on collars and pockets, a woven back and denim front, and crochet panels are some of the ways to go. Wool and Shimmer: If you’ve visited Mango this season as we’re sure you must have, you might have noticed the number of sweaters and boucle jackets with woven shimmer wool and sequins. The understated glossy luster makes for a great way to lift a regular wear jumper to evening and dinner wear. A statement bouclé jacket with different colored yarn and specks of gold or silver is a must have. We love the one spotted on Maheen Karim, a Joseph that she can’t get enough of. The best part is combination trends aren’t restrictive in the least. You can match any of the above to each other as well. Velvet and lace, sheer and leather, crochet and lace and so forth. Nida Azwer has recently created some beautiful modern saris using leather cut work, gota, silk, and screen print all in one. Have some fun experimenting with double or triple texture combos this year! Weekend Obsession: Zari Faisal Brings the Wow Factor!